One heart and one soul… This sums up the feeling I get when I think about Alison and Tyler’s union – the first wedding that I have captured in 2019. January 5th will remain a day that the couple and their families remember as Alison and Tyler said “I do.” This sweet couple stand out as one with many common interests and common career ambitions. It’s no surprise that they met about 5 years ago while interning in the DC area. Though they went separate ways initially, they reconnected about 2 years ago and the rest is history! Tyler’s proposal was sincere and came as a surprise to Alison and then the planning process began! 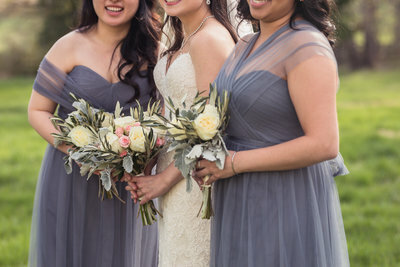 I loved the evergreen, gold, neutral tones of the wedding and they were perfect for the winter! When I saw the girls dresses I asked them if they would like a little baby’s breath for their hair, because it just seemed to fit the greens and natural feel of the day! Little details like this are so fun to see! I have to say Alison’s champagne shoes were just perfect and upon close inspection you will find a blue “I do,” on the bottom. The Ft. Belvoir Officers Club was the perfect background for this couple whose family is military-connected. (Thank you all for your service!) And everything was lovely! We had a little bit of drizzle in the morning, but when it was time for the official photos it was dry and the sun peeked out from behind the clouds and warmed everything up nicely! I love shooting at the Officer’s Club for many reasons, but in particular, the front porch offers so many great spots for photos, even when the weather is not ideal. 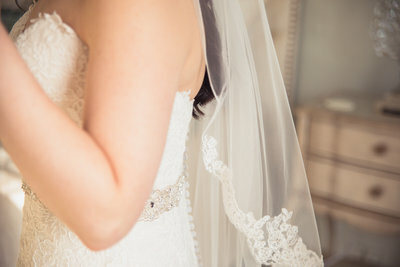 There were so many special moments throughout the day but some of my favorites were capturing the tenderness of the couple’s connection. Tyler exudes a gentle strength and caring compassionate heart. A few tears were shed and I felt the magnitude of them all. Alison’s smile lit up the room and her bridal party’s presence made the joy that everyone shared that much more meaningful. The bride’s sister shared how as a child she prayed specifically for a sister and how she feels that Tyler is every bit as amazing of a brother she could have ever asked for or prayed for. (THE BEST!). And Joe’s recollection of the Chick-Flick Mondays, how could anyone not laugh about?!? But perhaps one of the most amazing experiences of the wedding day is seeing how everyone is 100% supportive of Alison and Tyler. They are about to embark on a HUGE adventure in 2019! Newly married and moving to Romania! It’s not everyday that you meet someone who is going to move abroad, let alone move to Romania! And it’s not everyday that you meet someone who’s been to Romania! Back in the fall, when I found out that Alison and Tyler are moving to Romania, I was super excited because I have actually spent time there. This was years ago, before I went to college – I spent part of a summer there and was able to serve in an AIDS orphanage. I’ll never forget the experience. And although the country has changed so much since when I traveled there, I know the experience will be one that impacts Alison and Tyler’s marriage forever- for the good! 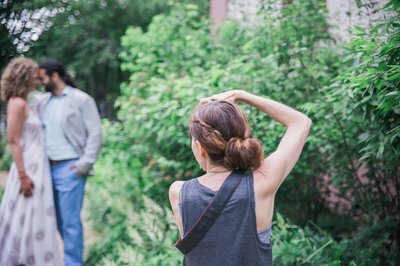 Thank you for trusting me to capture your wedding photos! I hope your day was every bit as special as you dreamt it would be and then some! Thank you for being flexible with me as I worked on some additional details that reflect your family’s legacy of military service. I am excited for your journey as a married couple and I can’t wait to hear about about your adventures in Romania. May the transition be smooth on every level – in marriage, in career, in housing and in getting all your household goods there safely. I hope you get to experience the beautiful summertime before the season changes. I hope that you fill countless photo albums with your travels in Europe and beyond, and I hope that your family will join you for some of those travels. May new friends be found quickly and the acclamation to the new culture go as well as it can. Much grace will be needed for the journey, but I know you’ll find it in the bond that you share and faith you carry with you. I join the wishes for you all and second what your best man said, “It’s not where you go that matters but who go with.” All the best and congratulations on your marriage!